Enjoy unforgettable sunsets across Lake Tashmoo & Vineyard Sound. Lakeside view shows main & upper deck, private bunkhouse (right). Large deck overlooks lake & Vineyard Sound. Cocktails, anyone? Fully-equipped kitchen with new appliances, lake & ocean views. Open dining area with lake & ocean views. Seats 10. Comfy living room with lake views, fireplace, flat screen, Wi-Fi. Work desk off master bedroom, hi-speed Wi-Fi, amazing views! Large master bedroom with king bed, TV & door to balcony. Upstairs bathroom-full tub & shower; serves master & 2nd bedroom. 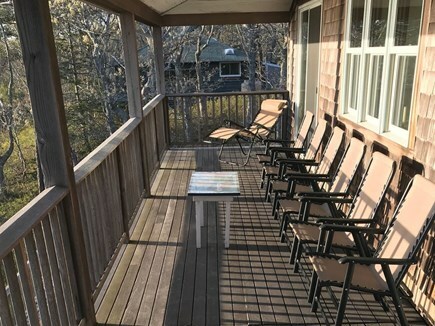 Balcony off master & 2nd bedroom offers great lake & ocean views. 2nd bedroom with door to balcony and amazing views. 3rd bedroom on main floor with queen bed and full closet. Bedroom 4 on lower level with study desk, sliding door to patio. Bedroom 5 (lower level) with two twin beds, play area. Accessible entrance, outdoor shower, ample parking. Built 1999. Rustic bunkhouse next to house offers wonderful privacy. Inside view of private bunkhouse with queen bed, wi-fi. 150-foot walk from the house to private beach on Lake Tashmoo! Incomparable views of Lake Tashmoo & the ocean from both levels. Welcome to Macy Tashmoo Pond! 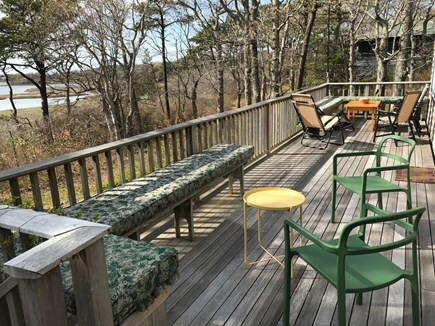 Enjoy spectacular lake and ocean views, amazing sunsets and your own private beach from this family-friendly Martha's Vineyard lakefront home! 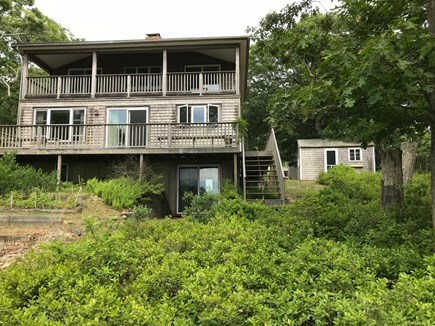 Set on the eastern edge of Lake Tashmoo, the house looks west over the lake and beyond it across the Vineyard Sound to the Elizabeth Islands. Built in 1999 on property that's been in our family for a century, the house sits on one and a half acres of prime lakefront off Herring Creek Road. 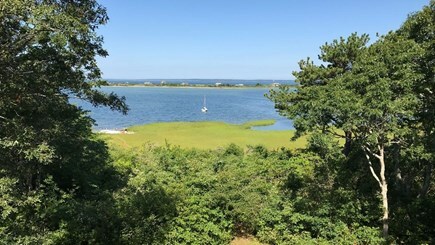 It is a mile from downtown Vineyard Haven. You will have convenient access to everything the Island has to offer, or you can just stay home and take it easy. Relax in the sunshine on the main deck or in the shade of the covered upstairs deck while you take in the spectacular views and feel the cool breeze coming off the lake. Walk about 50 yards from the house for kayaking, sailing, clamming or a swim in the lake. Or walk to nearby White's Beach (3/10 mile) or Lake Tashmoo Town Beach (7/10 mile). Mink Meadows golf course is also within walking distance (9/10 mile). The house is equipped with high-speed internet, wi-fi accessible from every room in the house (and bunkhouse) and two televisions. Use the land line for unlimited domestic calling. 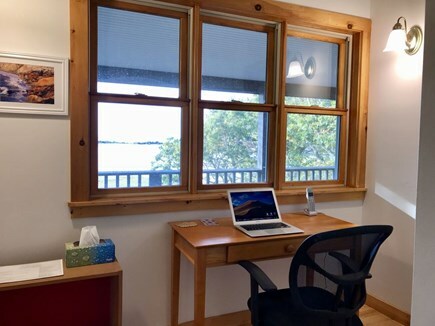 If you absolutely must do some work, a comfortable work nook off the master bedroom provides gorgeous views to distract you. 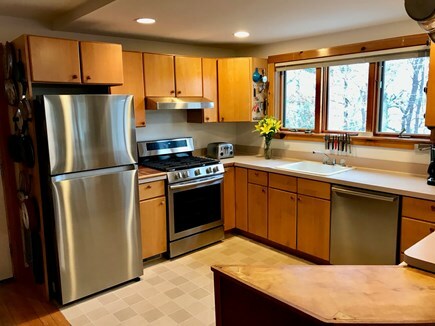 The kitchen is equipped with a new refrigerator, range and dishwasher installed in March 2019. A second refrigerator on the lower level provides extra room for drinks and food for your family. Plenty of dishes, wine glasses and serving dishes are provided. Cushioned window seats, books, toys and games are available to enhance your stay. Clean linens, towels and beach towels are provided. This is our home and we look forward to sharing it with you. Sleeping accommodations include a king bed in the master bedroom and queen beds in the other three bedrooms and separate bunkhouse. In addition, there are two twin beds in the sleeping nook on the lower level. All linens and towels are provided. Ocean breezes keep the temperature mild, but fans and central heat are available if needed. There is a full house backup generator. If a power outage occurs, power is restored immediately. Grab bars on the shower and bathtub, a first floor bedroom and a ramp to the entrance make the house accessible. Additional pricing info: $275 cleaning fee added. All linens & towels provided. State and local taxes of 11.7% will apply. Ramp to main entrance; grab bars in bathrooms; first floor bedroom; first floor bathroom with shower seat. February may not have the most favorable weather for vacationing but the sun did shine and we found some wonderful activities. The conch at Chef Deon's restaurant in O.B. made a chilly evening much warmer as did the sing-along at the Charter School the following evening. Daytime activities were pleasant with lack of 'summer' traffic. One can get around easily and in plenty of time. It's not as green as summer but the more stark landscapes are beautiful in a different way. A very comfortable house in a beautiful woodsy setting. Perfect for a winter getaway! Wonderful location for our family Thanksgiving! A most comfortable house with terrific views! Great location and very thoughtful hosts! Beautiful, peaceful, and the hosts think of everything! Highly recommend! Many thanks for the wonderful weekend getaway! Beautiful setting. Remote feel but not far from town. A group of 7 college guy friends (now all in our mid 60's) were looking for an affordable house that was big enough to accommodate us and that might offer something special. We found it in this rental. The house's fixtures/appointments are somewhat dated, but the owners have thought of everything and we did not go for want on anything. There were two full-sized bathrooms, plenty of beds (we each had our own), nice open concept between kitchen/dining/living rooms and it all opened up to a big deck overlooking the saltwater lake. We golfed during our stay. Mink Meadow Golf is within walking distance and Farm Neck isn't a bad ride (15-20 minutes?). All the conveniences of home (cable/internet TV, internet, etc.) for us to watch the Patriots and Red Sox at night. We also took the walk down to the beach several times (maybe a mile) through the woods and out along the sandbar. Very nice and relaxing. Perfect setting for a group like ours or a big family get together. Owners couldn't have been nicer (although we never actually met), and made us feel very welcome. Not fancy, but perfect for our needs. We would definitely book it again. A quintessential and wonderful Martha's Vineyard vacation spot...could not do better. Nothing but great things to say about this property and the owners. The house is well-equipped and immaculate. It is spacious, warm and accommodating. It's setting is absolutely amazing, quiet, serene, tranquil, and on the water with amazing views. And yet, five minutes to Vineyard Haven, 10 to Oak Bluffs and 15 to Edgartown. The Macy's are great hosts, from your welcoming basket, to every detail imaginable in the advance packet you will receive in an email. Tim Macy is the contact for the family, and replies consistently and promptly within an hour. I hosted extended family here at the Macy home. Each and every person who stayed at their home commented that they hoped I could get the home again next year. 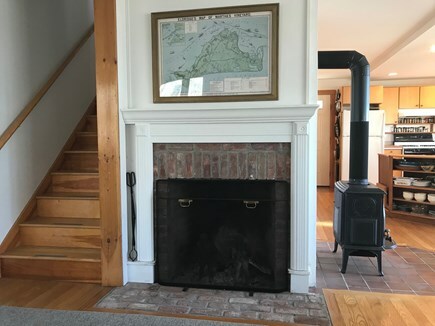 Although I live here on the island year round , and I am very aware of my many choices, I would look no further than renting this home again. The only real problem I see here is letting too many people know about this great home and it becoming too difficult to get. In all seriousness, a wonderful home and wonderful experience. The house was so well prepared for our stay. The hosts communicated with us regularly to ensure a great stay. The gift basket when we arrived was lovely. Great location, private yet close to everything. Thank you! The Macy’s were kind enough to allow an early check-in, which was hugely helpful. The property was a perfect home base for our crew who was in town for my sisters wedding. She lives on-island year round and the Tashmoo locale was so incredibly convenient for rest, relaxation, letting the kids run free. We had perfect proximity to our island friends, the venue, ferries and town. I personally stayed in the guest shed and absolutely loved the privacy and views. We will definitely rent again, hopefully for longer and are forever grateful to the Macy family for sharing their slice of paradise with us! Three generations all under one roof, with plenty of space and room at the dinning room table for all of us. The kids loved playing on the beach and water right in the back yard and the very short walk to the bigger beach was perfect! We had a blast and hope to come back next year! Our family and friends rented this house the first week in July. When we arrived, there was a lovely basket of thoughtful treats (from wine to oatmeal to teas). The house was very well stocked for cooking, relaxing (board games and books available) and had comfortable sleeping arrangements (there were ten of us - 6 adults and 4 kids). It was also clean and as my son says "felt homey." The view from the main room of the house was very tranquil, overlooking the lake and stretching out to the Vineyard Sound. The water access was just a quick walk and the water itself was lovely. It was a bit buggy by the lake and on the porch in the evenings but applying the bug spray helped. We brought a kayak and had a fun time exploring the lake which is shallow so not intimidating, particularly for younger kayakers. It's also great to have the option of walking to the Lake Tashmoo Beach. The beach is calm and nice for swimming and fishing. If you wish to get into Vineyard Haven, it's a short ride. So nice to have the privacy/serenity of the house but also close to action if you preferred it. Everyone enjoyed themselves, relaxed and reconnected. The Macy's were also very responsive with any questions we had during the stay. Their hospitality was very much appreciated. Tim, Sarah, Mike and John Macy are third-generation owners of this property purchased by our grandfather a hundred years ago. It was passed along to us by our parents in 2016 and we are now offering it for vacation rentals to preserve it for future generations.